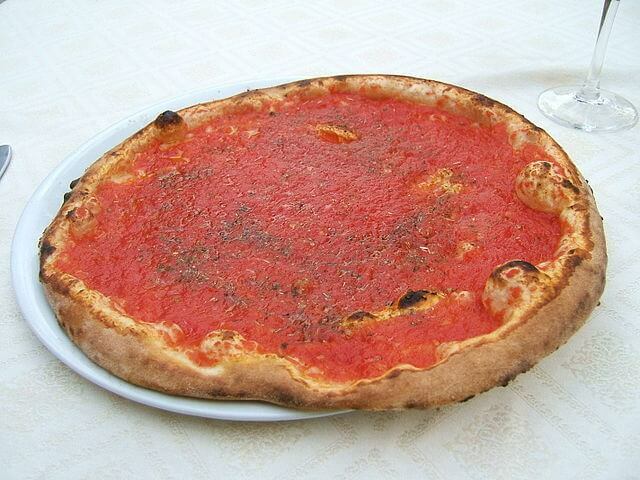 I love pizza and having an easy pizza sauce that I know is full of good ingredients is important to me. Its wonderful to be able to open the pantry and take out a fresh can of pizza sauce and add lots of yummy toppings (which are always different every time I seem to make pizza). Easy meals and anything that makes the family happy, makes me happy! This recipe will make around 7-8 pints, or if you are doing it in half pints, you will get 14-16 (at least thats what my maths says!) You dont have to have fresh tomatoes, although at this time of year, you may have them still around. You can use frozen tomatoes also. To prepare tomato puree from frozen tomatoes: (assuming they were cleaned and cored before freezing) leave to thaw 24 hours; drain accumulated juices and put through a strainer to remove seeds and peels (like a Victorio hand-crank or a tripod metal food mill/press). You may need to heat the tomatoes briefly for easier straining, but only until just warmed. To prepare tomato puree from fresh tomatoes: wash, core and halve tomatoes; heat to boiling (use a 12-qt. stockpot and a 6-qt. soup pot for 22 lbs); put through a strainer to remove seeds and peels. Make the pizza sauce: in a 12-qt. stockpot cook onions and garlic in the olive oil over medium heat until the onion softens. Add tomato puree and all the seasonings (basil through pepper flakes), bring to a boil, reduce heat and cook for about 30 minutes, uncovered. Process with an immersion blender to make a smoother sauce (or carefully blend in batches). Bring back to a boil; reduce heat and simmer, uncovered, until sauce reaches desired consistency (reduced by ¼ to ⅓), usually an hour or two. Make sure to stir occasionally to prevent sticking (if you have a thin-bottomed stock-pot, stir more often to prevent scorching). To can: add the lemon juice or citric acid to each clean, warm jar, fill jar with sauce leaving ½-inch headspace and attach lids and rings until fingertip-tight. Place in canner rack and repeat with remaining jars to fill canner (keep sauce, lids and jars warm, as you will need to do a couple canner loads when using half-pints). Process both pints and half-pints for 35 minutes in a boiling-water canner (find more details in our Canning 101 steps found in the recipe index). Remove to a towel-lined surface and let sit undisturbed for 24 hours before checking seals, labeling and storing in a cool, dark place.